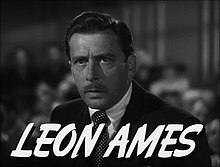 Leon Ames (January 20, 1902 – October 12, 1993) was an American movie and television actor. He was known for his roles in Meet Me in St. Louis (1944), The Postman Always Rings Twice (1946), Little Women (1949), On Moonlight Bay (1951) and By the Light of the Silvery Moon (1953). This page was last changed on 18 June 2014, at 19:59.